Our Founders - Power Conversion Technologies, Inc.
There’s something to be said for entrepreneurs who are involved in their field for most of their lives. You’ll find that both of the PCTI founders have that in common—it’s in their blood. Cathy began her exposure to power electronics by helping her father’s power electronic startup when she was just 8. She and her sisters assembled printed circuit boards on the dining room table, and later had the opportunity to work at various jobs within the company while in high school and college. After graduating Lafayette College as an electrical engineer, she began her career at Westinghouse (later Eaton) as a product engineer. She engineered and marketed medium voltage switch gears and substations to Northeastern US utility companies. Later, she worked at Controlled Systems, Inc. (a manufacturer of motor starters, VFDs, frequency converters for aircraft ground support, and PWM inverters) as Sales Manager. At Controlled Systems, Cathy and Mihai Chis, executed a turnaround of CSI, increasing their backlog from $400K to $32M in less than 2 years. Cathy obtained her MS from CMU in 1993. She and Mihai started PCTI in 1991 with the mission to provide technically innovative power electronics to the global market in the highest power ranges. Cathy’s expertise lies in operations management. Like any entrepreneur, at PCTI she attends to a variety of responsibilities including financial management, sales and marketing, engineering management, production, quality control and safety. Mihai Chis is a power electronics expert of unusual caliber and has a very interesting history. As a child, Mihai’s uncle would wake him up in the middle of the night and ask him math questions (as he was a whiz at math from a young age). Since he knew the best way to get an education was in the military, he signed himself up for the Navy high school in Romania at age 14, much to the consternation of his parents. After the Navy high school, he was one of 3 students selected out of 2000 to attend the Russian Naval Academy in Baku, Azerbaijan. There he received two MS degrees (Artillery Computing, Automated Missile Control), and also received the Academic Gold Medal for perfect grades during his tenure. At age 22, he became the Chief of Staff to the Naval Minister of defense, where his tasks would include being in charge of visiting military dignitaries such as Russian General Zhukov (Stalin’s favorite general who was key in saving Russia from Hitler). Later, Mihai served as an officer in the Romanian Navy as a Missile Projectile Specialist. Because his tenure in the Navy was during the time of high tensions and military secrecy of the cold war, the Romanian Navy discharged him not with his technical engineering degrees, but with an economics degree. He was forced to be employed as a worker while he went back to school and earned another MS in Electrical Engineering in order to be able to work as an engineer in the field. Later he earned a PhD in Semiconductor Thermal Management. While in Romania, he started a division at IPRS Baneasa that grew to $200m in sales with 45 engineers, 60 technicians and 450 workers, lead a division at Electro-Technica, transforming an electromechanical company of 500 people to 3500 people, 800 product lines and $1B in revenues, and was a international technical diplomat for an organization that prepared 5, 10, & 20 year plans for the electrical industry for the all the eastern bloc countries. During these meetings in Moscow, often meeting Russian government diplomats such as Gorbachev and Yeltsin. Mihai worked extensively throughout the eastern block countries on equipment for heavy industrial applications such as Siberian oil drilling, steel making, and transportation. The divisions he led not only made the apparatus, but all of the passive and active components within including semiconductors, capacitors and magnetics. After defecting to the US, Mihai worked at Spang Power Controls as Chief Engineer where his efforts directly contributed to increasing revenues from $7m to $24m in 2 years. Similarly, as Chief Engineer at Controlled Systems, Inc, he (along with Cathy) executed a turnaround, increased backlog from $400K to $32m in 1.5 years. 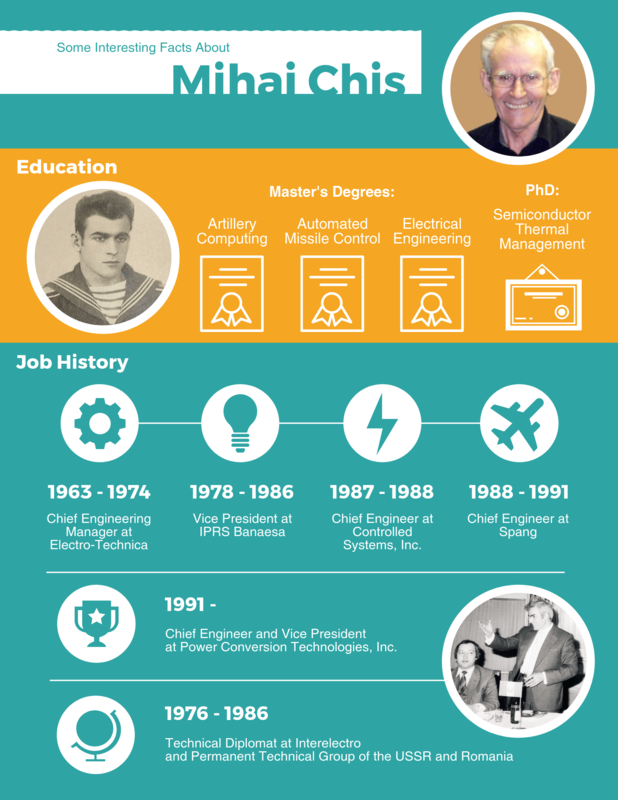 At PCTI, serving as Chief Engineer and Vice President, Mihai was free to innovate as he saw fit. Mihai commenced research in 1995 on a next-generation universal DSP (digital signal processor) controller which was first commercialized in 1998. Other example projects include building high power rectifiers up to 15MW in applications such as alongside power for submarines, DC arc/plasma application, desalinization, missile ground support and chlorine plants, a project for NASA for special power supply to provide ground power for payloads on the space shuttle prior to liftoff as part of the International Space Station, directing design of the frequency converter product line used for military aircraft ground support, and directing design of battery charger product line used in critical applications such as for submarine battery chargers and power plants. Within PCTI, his responsibilities included directing R&D, engineering, management, and production. Although recently retired, Mihai’s influence and leading-edge innovative genius continues to be reflected in the designs of the equipment PCTI manufactures. One of the reasons customers choose to work with us is because PCTI is uniquely qualified to design, build and test custom power electronic equipment; customers have difficulty finding competitive manufacturers to address their specific application needs. This is due to Mihai’s expert ability to address the increasingly diverse custom requirements that leading-edge industries demand–and he makes it look easy. The flexibility of PCTI’s designs as well as the expertise of the staff that were under Mihai’s tutelage for years permits PCTI to easily address custom requirements with innovative solutions, following the tradition that Mihai set.